This Adult Fred Costume will transform you into the preppy member of the Scooby Doo gang. 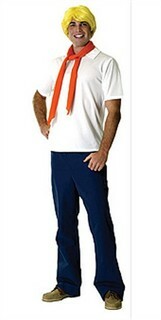 This Fred outfit includes his trademark white shirt, blue pants, and orange scarf and, to top off your retro costume look, a blonde Fred wig. Fred may be known for telling the gang to split up, but in this Halloween costume, you can help keep the group together in a popular throwback Scooby Doo group costume. This Adult Fred Halloween Costume comes in a standard size that fits most adults. Availability: This Scooby Doo Fred Costume takes approximately 1 business day to leave the warehouse. Please not: costumes with wigs are not returnable.